I have been loving crock pot meals recently! I usually cook multiple meals at once and store them for individual meals because Nick and I aren’t both home for dinner at the same time. The crock pot allows me to cook multiple meals at once with one in each crock pot, one or two on the stove, and some in the oven as well. For this meal, I tried a new recipe. I recently bought sticky rice and used a small crock-pot to cook the rice. The directions said to include everything except the corn starch into the crock pot and cook until the pork is ready to pull. Then, add the sauce into a sauce pan, add the cornstarch, and cook for about 4 minutes until the sauce is a thick consistency. But, we all know I never actually follow a recipe to the tee so I just added the corn starch into the mixture when I first put it into the crock pot. It worked out great and I had less to clean up! 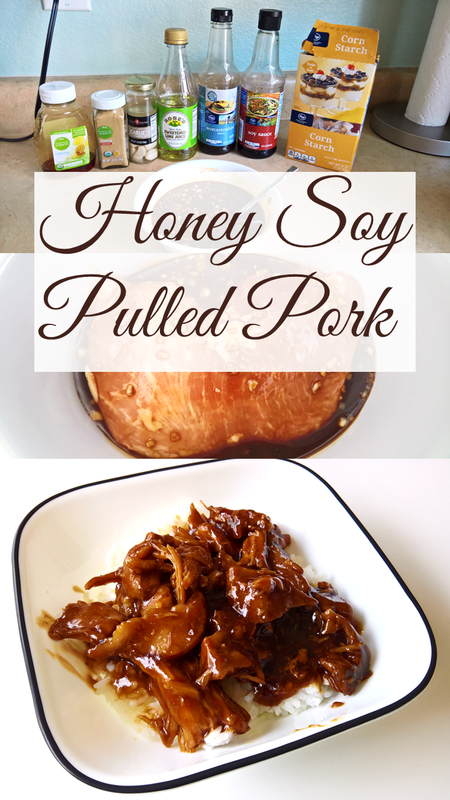 This pork is easily one of our favorite meals now! I’d probably do long grained rice next time though instead of sticky rice. You can also add any vegetables you want to the meal. Let me know if you make this recipe and which method you used for thickening the sauce. This looks so good!! I love crock pot meals!! This looks so good! Love anything you can make in a crock pot! This looks so good, can’t believe I am saying this because I wasnt eating pork a few years ago. This is one hell of a dish, Kari! I will definitely try your recipe!